Mandelli1953 won the prestigious Good Design Award 2017 for the Zeit handle designed by Marco Piva and for the new Juno project, the concrete handle by Alessandro Dubini. The authoritative recognition, assigned by the Chicago Athenaeum Museum of Architecture and Design and promoted by the European Centre for Architecture Art Design and Urban Studies, is awarded to the most innovative products of the year that stand out for functionality, concept research, material used, sustainability and of course aesthetics. Mandelli 1953 confirms its vocation to the never-ending study of new design solutions aimed at being recognized as one of the leading manufacturers of quality handles, 100% made in Italy. The winning projects will be exhibited permanently inside the Chicago Athenaeum. A concept born from the desire to put the accent on a material that is atypical in the ambit of handle production: concrete. 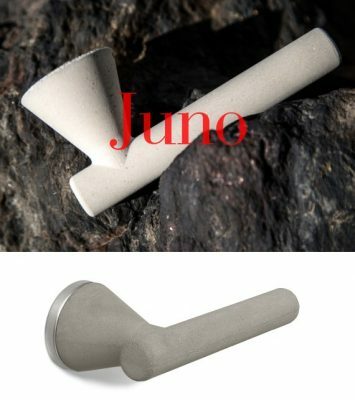 The manufacturing process recalls the ancient technique of forging with molds and the fusion of solid volumes: the resulting aesthetics of Juno are of great visual impact despite a pared-down and minimalist design. A simplicity that is further enhanced by the project of designer Alessandro Dubini who has cared about each aspect of its development. The textural nature of concrete almost seems to disappear thanks to a nanotechnological treatment which confers a visual and tactile homogeneity, as if it were a comfortable and versatile material. 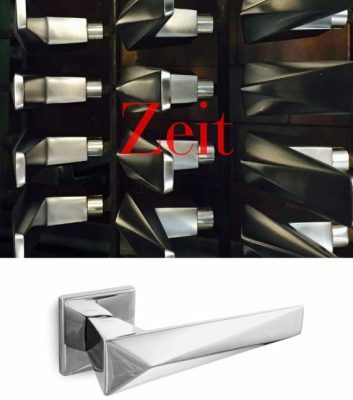 The Zeit model, which was born from the collaboration with Marco Piva, is a totally innovative handle. It is indeed produced through a highly industrial brass casting process, then it is expertly finished manually by skilled artisans. A work of research on shapes and materials, on new visual and tactile effects that characterize an everyday object. Time going by is the a metaphor of the “passage” that ZEIT (“time” in German) represents: 12 are the months of the year, 12 the sectors on the clock face and 12 the faces created symmetrically in the body of ZEIT. It is proposed in various finishes: glossy chrome, satin-finished chrome, glossy gold and satin-finished gold. The Chicago Athenaeum Museum of Architecture and Design and Metropolitan Arts Press Ltd. present the Museum’s annual GOOD DESIGN ® Awards Program for the most innovative and cutting-edge industrial, product, and graphic designs produced around the world. The deadline for this year’s submission is June 1st, 2017. Each year, The Chicago Athenaeum presents the GOOD DESIGN Awards Program for the most innovative and cutting-edge industrial, product, and graphic designs produced around the world. The program called for three shows a year: one during the Chicago winter furniture market in January, another coinciding with the June summer market, and a November show based on the previous two exhibitions. Each year, a different prestigious designer was selected to curate the installation. Charles and Ray designed the 5,300-square-foot space for the inaugural installation in 1950, followed by Finn Juhl, Paul Rudolph, and Alexander Girard. 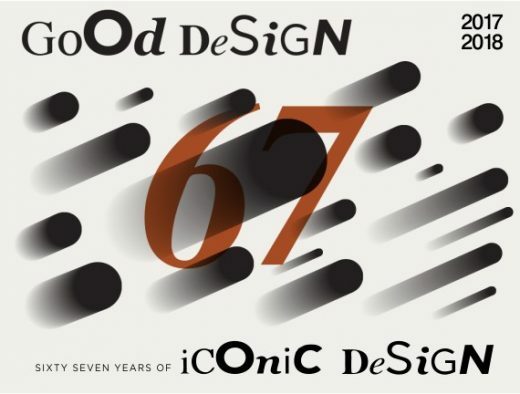 Now in its 67th year, GOOD DESIGN is the oldest and the most prestigious Awards Program organized worldwide. Founded in Chicago in 1950 by the former MoMA curator Edgar Kaufmann, Jr., together with such pioneers in modern design as Charles and Ray Eames, Russel Wright, George Nelson, and Eero Saarinen, GOOD DESIGN honors the yearly achievements of the best industrial and graphic designers and world manufacturers for their pursuit of extraordinary design excellence. For over seven decades since its inception, The Chicago Athenaeum continues the organization of the program to create a revived awareness about contemporary design and to honor both products and industry leaders in design and manufacturing that have chartered new directions and pushed the envelope for competitive products in the world marketplace. Every year, designers and manufactures in about 50 nations are honored for their singular achievements in producing hallmarks of contemporary design. For 65 years, everything and anything produced in and for the environment from a paperclip to a Boeing 787 Dreamliner or NASA Space Ship have been honored. The GOOD DESIGN logo was designed by Chicago designer, Mort Goldsholl, in 1950. The black dot and square-shaped logo is used globally by winning companies to publically announce that their products and graphic designs have met the most strident and professional criteria and highest standard for international Design Excellence. Since 1950, the Museum has awarded approximately 40,000 GOOD DESIGN Awards for design and innovation, sustainability, creativity, branding, ecologically responsible design, human factors, materials, technology, graphic arts, packaging, and universal design by various industrial design and graphic design firms working for the world’s major manufacturers and Fortune 500 companies in over 50 countries. The emphasis of the GOOD DESIGN program is on quality design of the highest form, function, and aesthetics a standard beyond ordinary consumer products and graphics. The Chicago Athenaeum’s GOOD DESIGN program forwards the ideals of a design process that embodies product excellence and endurance and strong public identity. Submissions to the program are judged by a jury of distinguished design professionals and leading industry specialists and design press on criteria established in the original 1950 program for the highest aesthetic in terms of innovative design, new technologies, form, materials, construction, concept, function, utility, and energy efficiency, and sensitivity to the environment. Awarded design firms and manufacturers have the right to enter into a limited legal licensing agreement to use of the Museum’s GOOD DESIGN logo to mark and identify the selected product or graphic in their marketing, publications, promotions, and communication campaigns as a public symbol of product and service quality. This public seal of approval immediately informs consumers to understand that the selected product and graphic meets the most rigorous test and criteria for absolute design excellence. GOOD DESIGN is an international symbol of a company’s firm commitment to innovation and superior design embodiment. Materials and products are accessed into the Museum’s Permanent Design Collection and frequently exhibited in the United States and abroad. In this year’s edition, selected products and graphics for GOOD DESIGN are announced to the international press in December. The Awarded products and graphics are accessioned into the Museum’s Permanent Design Collection. Selected designers and manufacturers are allowed use of the Museum’s GOOD DESIGN logo in publications, promotions, and marketing as specified in the joint legal agreement with The Chicago Athenaeum. The fee is $375.00 USD per entry. Checks are made payable to Metropolitan Arts Press or payment by American Express, Master Card, or VISA. DUBLIN, IRELAND…SEPEMBER 26, 2010…. The City of Madrid is full of surprises. If the complexities of today’s urban life with large cities full of historical and modern buildings and a busy metropolis of high density neighborhoods and bustling urban traffic are to be avoided for the pristine countryside and open rural spaces, think again. Madrid is full of abundant huge green parks, magnificent tree-lined boulevards, flowers, emblematric green-scapes, vertical gardens, a boating lake, and an enormous sprawling parkland making the Capital of Spain one of the world’s leading examples of urban beautification and a Green Renaissance in our 21st Century. “The City of Madrid,” states Christian K. Narkiewicz-Laine, Museum President, The Chicago Athenaeum: Museum of Architecture “ is one of the ‘greenest’ cities on our planet,” as The Chicago Athenaeum, together with the European Centre for Architecture Art Design and Urban Studies announce the City of Madrid as the first of over 100 Green GOOD DESIGN™ Awards for 2010. Founded in Chicago in 1950 by architects Eero Saarinen and Charles and Ray Eames, GOOD DESIGN is the world’s oldest and most significant global program that awards the best of the best design in terms of visionary products and environments. Every year, thousands of leading industrial and graphic design firms, manufacturers, and leading FORTUNE 500 companies vie for this prestigious award worldwide. The familiar GOOD DESIGN logo, a circle inside a square, designed by Chicago graphic designer, Mort Goldsholl in 1950, is one of the world’s most visible and highly recognized public branding marks. In 2008, The Chicago Athenaeum and The European Centre added a “Green” edition to this historic Awards Program as a way to emphasize and promote the best new products and environments that are leading today’s “Green Revolution” in order to make a public education statement about the importance of sustainability for consumer product design and our global architecture. >For 2010, the Green GOOD DESIGN Awards recognize cities, governments, organizations, research, programs, and people who are blazing a new path toward a sustainable environment together with new products, buildings and landscape and urban planning projects. The Green GOOD DESIGN Awards are decided by The European Centre’s International Advisory Committee, which is comprised of European leaders in the design industry, manufacturing, and in architecture. Subsequent Green Awards (over 100 in all) for 2010 in the categories of industrial and product design, architecture, landscape architecture, and urban planning are to be released by both institutions by the end of this month. This year (2010), Green GOOD DESIGN Awards were given to the City of Madrid and products, designs, ideas, buildings, and urban planning projects from over 31 nations. At 650m above sea level on a high continental plateau, Madrid is the highest capital city in Europe. The Comunidad de Madrid—in the center of which lies Madrid in a rough triangle—covers 7,995 sq. km, less than 2% of Spain’s territory. The City’s population is roughly 3.2 million while the estimated metropolitan area is calculated to be 5.84 million. Madrid, its streets populated with trees, has the second highest number of aligned trees in the world, with 298,000 units, only exceeded by Tokyo. Green areas are constantly and continuously growing also surpassing the European average. Since 1997, green areas have increased by 16%. At present, 8.2% of Madrid’s grounds are green areas, meaning that there are 16m2 of green area per inhabitant, far exceeding again the 10m2 per inhabitant recommended by the World Health Organization. In order to reduce pollution, Madrid’s city authorities have considered introducing a London-style congestion charge, but to day such a plan has not been enacted. Over four million vehicles enter and leave the capital everyday. The resulting cloud of pollution that settles over Madrid on a windless day is known locally as the “grey beret.” Spain’s obsession with diesel-fuelled cars (which produced seven times more pollution than cars running on unleaded petrol) only exacerbates the problem. One obvious measure to stem pollution has been the current pedestrianisation of many inner-city streets, among them Calle de Arenal and some 40 hectares of streets in the barrio of Huertas, which have been closed to all but local traffic. Madrid’s constant investment in an already impressive underground metro system—one of the 10 longest in the world and the third longest in Europe—ensures that Madrid’s high pollution levels can no longer be blamed on inadequate public transport. Since 2000, more than 100km have been added to the network, drawing an ever-growing number of satellite towns into the system. While garbage is collected in the Capital every night, recycling is, unfortunately, optional and largely ignored. Beyond the city, the planned upgrading of the M-501 through the west of the Comunidad de Madrid has been hugely controversial. Environmentalists argue that the road expansion threatens 13 nesting pairs of the endangered Iberian Imperial Eagle, as well as destroying woodlands the shelter 10% of Spain’s endangered species and possibly the world’s most endangered cat species, the Iberia lynx. The success of Madrid as one the world’s foremost green cities is directly attributed to the astute leadership of Madrid’s Mayor, Alberto Ruiz-Gallardón, who has become affectionately known by the locals as “The Pharaoh” just for the sheer size and audacity of his visionary infrastructure projects. Mayor Ruiz-Gallardón is one of Europe’s most popular politicians and easily won the last election winning 34 out of the 57 seats. “The Chicago Athenaeum and The European Centre are proud to bestow this Award to the City of Madrid,” states Mr. Narkiewicz-Laine. “The City and The World” Symposium runs in Madrid from November 4-7, 2010.